A major challenge for high profile brands is how to react to a crisis, this can be logistical or a scandal within the public domain. Although differing in seriousness and effect, YouGov data can illustrate the impact negative publicity can have on major brands. 20th June was a catastrophic day for online fashion and beauty store, ASOS when a fire broke out at their main warehouse in Barnsley, forcing the company to stop taking orders for almost three days. The effects of the fire and sprinkler system had damaged an estimated 20% of the stock held there and customers were left unaware about the delivery of their prior orders. Last year, on 24th April, 2013, Primark went through a far more serious ordeal when a building collapsed at a clothing manufacturer near Dhaka, Bangladesh. The clothing retailer was one of many companies linked to the factory. So how did consumer perception of both brands change six weeks after their respective periods of difficulty? YouGov’s BrandIndex tool was used to measure how both brands’ health have played out among consumers during their crisis by measuring the Buzz scores (which measures whether people have heard anything positive or negative about the brand in the last two weeks) and Attention score (measures recent awareness of the brand, regardless of sentiment). If we take a look at the Buzz metric of both brands, we find that what the public had heard at the time of crisis was negative. ASOS stood at 1.3 points compared to Primark’s 1.7. 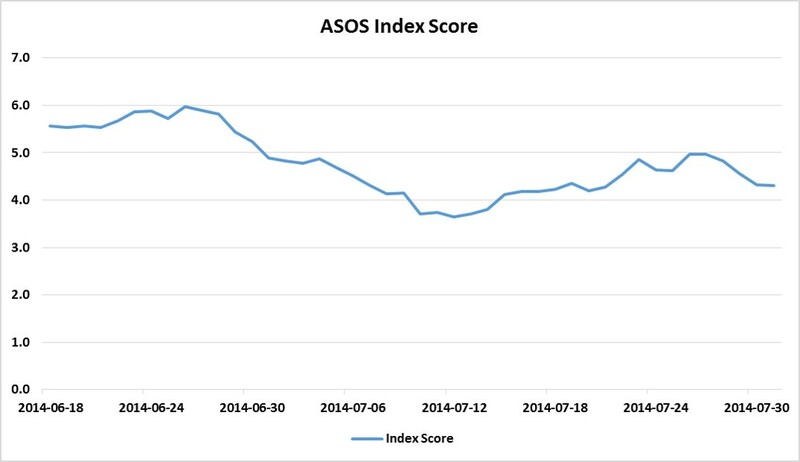 Two weeks after their respective disasters, ASOS’s score fell to -3.3 but Primark’s buzz score plummeted to a low of -20.8. Both of their points began to pick up four weeks after their lowest points but not quite regaining their scores prior to their individual disasters. ASOS’ score rose to 0.7 on 30 July while Primark -6.0 on 4 June, 2013. 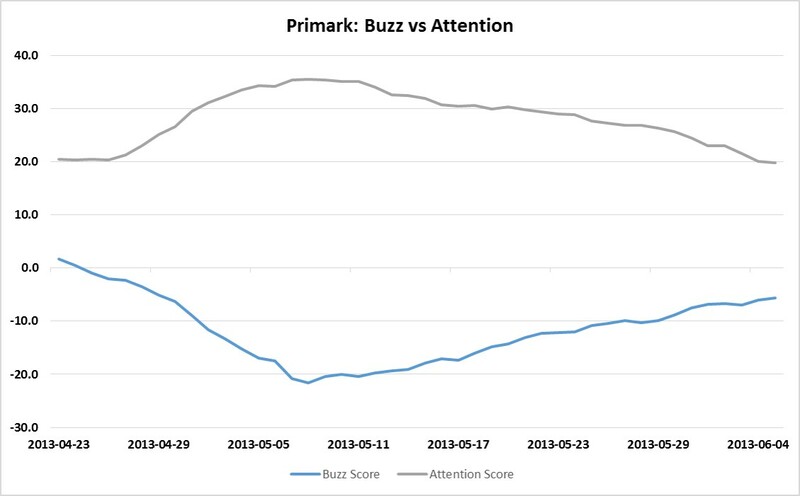 By comparing the Attention scores for both brands, we can see why Primark’s buzz scores may have dropped drastically compared to ASOS. 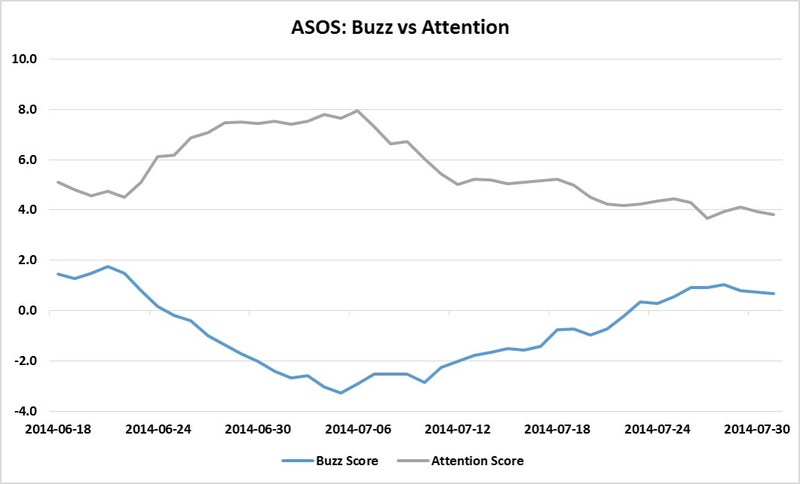 ASOS’s Attention point decreased from 5.1 to 7.9 in a space of two weeks while Primark’s scores rose by 14.8 points (from 20.8 to 35.6). 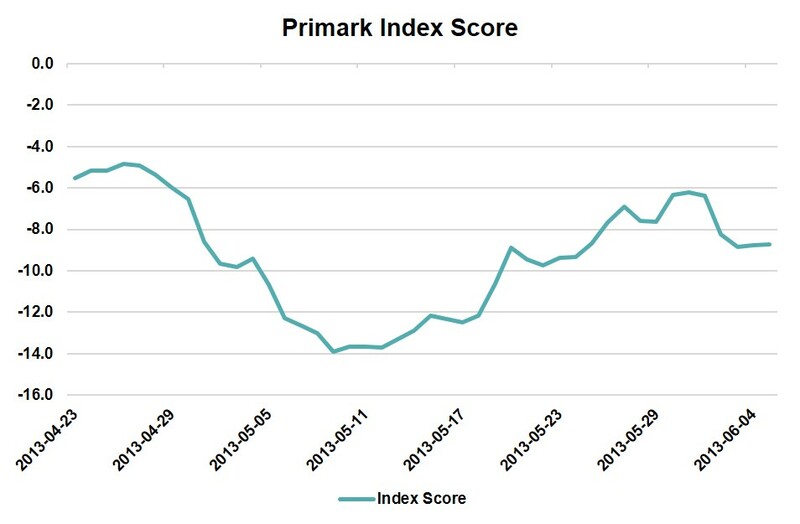 Looking at the Index scores for both brands, we can see that Primark had the biggest blow when compared to ASOS. Their Index score was down by 19.4 points (from -5.5 to -13.9) while ASOS’s index fell by 1.9 points (from 5.5 to 4.3). Although both brands did not go back to their initial scores after six-weeks, their index scores began to increase after hitting their low-points. Primark stood at -8.8 by 4th June, 2013 while ASOS 4.3 by 31 June. Both brands did fairly well in recovering consumer opinion. ASOS was able to implement an effective recovery plan and was back in service within 48 hours after the fire. They also wooed back some of their customers by offering a massive summer sale. Similarly, Primark was able to recover the majority of their scores by assisting their workers and committing to work towards a better living wage.